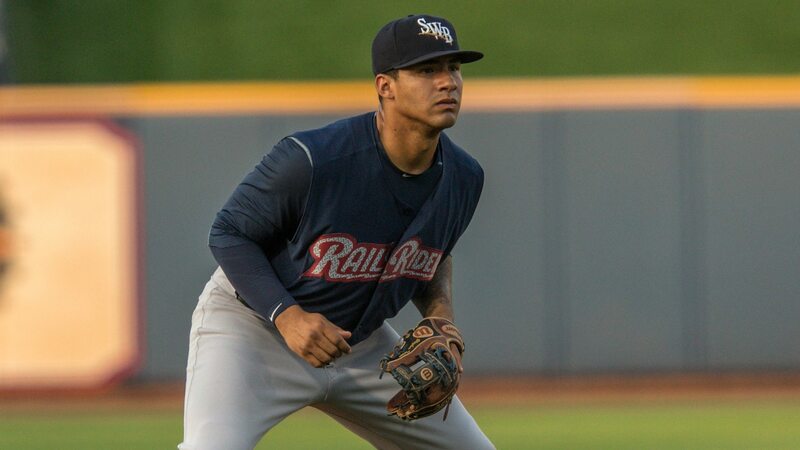 Gleyber Torres has spent nearly a month rehabbing his surgically repaired left elbow in Tampa, Fla., and he’s anxious about what the next two months have in store. The Yankees’ top-ranked prospect — along with big leaguers Aaron Judge, Didi Gregorius, and Greg Bird, to name a few — participated in workouts at the George M. Steinbrenner Field complex on Monday morning. Torres told MLB.com’s Bryan Hoch that he’s “super excited” to begin spring training activities. While most of the offseason hubbub has revolved around the Yankees’ acquisition of reigning National League MVP Giancarlo Stanton, the focus will soon shift toward Torres and his candidacy for a spot on the major league roster. Since New York’s blockbuster trade with the Miami Marlins involved a package headlined by second baseman Starlin Castro, the Yankees currently have a vacancy at the position. Torres will compete with rookie infielder Tyler Wade, utility man Ronald Torreyes, and others once camp starts. The consensus is that the Yankees will offer Torres ample opportunities to win the second base battle this spring, but a few factors could delay the 21-year-old’s Big League debut in 2018. Although Torres has properly recovered from season-ending Tommy John surgery he underwent last June, the club has been bringing him back slowly. With just 23 games worth of Triple-A experience under his belt, Torres may see more time in the Minors should he need to shake off some rust. But even if Torres is healthy and prepared by Opening Day, the Yankees could still postpone his promotion until a few weeks into the regular season. After April 14, Torres wouldn’t be able to amass a year’s worth of service, which means the Yankees would then have seven years of control over Torres instead of six. A few seasons ago, the Chicago Cubs made this move with All-Star third baseman Kris Bryant, calling him up in mid-April. Under this plan (which is logically sound), Torres would spend two-or-so weeks in the minors before a call-up. If that’s the case, the Yankees do have a depth of infielders who could play the position in that time frame. Alongside names like Torreyes and Wade, newbies Jace Peterson and Danny Espinosa will also work with the club this spring, and one or two of those four names may be on the roster come late March. In 55 games between Triple-A Scranton/Wilkes-Barre and Double-A Trenton last season, Torres slashed .287/.383/.480 with 14 doubles and 34 RBI, and on Jan. 27, MLB Pipeline ranked Torres the fifth-best prospect in baseball.